“Solar Superstorms” features another big star in addition to the Sun: popular actor Benedict Cumberbatch as narrator. His presence in this new, 24-minute fulldome science documentary distributed by Spitz Creative Media has reportedly sparked an impressive amount of public demand from people who might not normally find their way into the planetarium. Remember the fictional events and chain reactions that took a chunk out of Earth’s communications in the feature film “Gravity”? “Solar Superstorms” shows how the natural activity of our Sun could lead to an equally disruptive, real-world disruption of the modern communications grid. 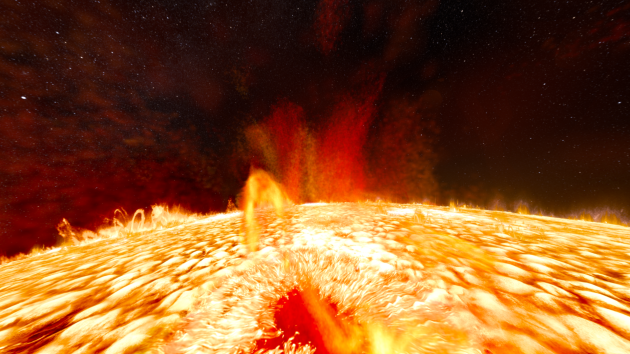 “Solar Superstorms” was made possible with support from the Commonwealth of Pennsylvania and the Pennsylvania Film Office and funding by the National Science Foundation (NSF). As of August 2015 it was in 20 theaters and produced in six language versions with more to come. It is being made available in 4K 2D, with 5.1 or stereo soundtrack. For their part, the supercomputers now being used to analyze the Sun are increasingly busy. Said Cox, “As supercomputer speeds have increased 100+ fold, teams of scientists generate increasing volumes of numbers that reveal the hidden laws of the universe. The goal of our group is to transform this massive data into a cinematic experience that conveys the science.” The growing complexity of scientific data sets is complemented by better rendering tools and the heightened display capability of top-line 8K fulldome systems, now accepted among the industry as good enough even to fill the place of 15/70 film. In addition to never-before-seen solar visualizations, “Solar Superstorms” shares a story that today’s viewers can relate to personally. It uses the example of a solar eruption that penetrated Earth’s atmosphere some 150 years ago to make a point about the vulnerability of our present day communications grid. The Carrington Event was named after Richard Carrington, an astronomer who observed and documented it. Even in a much simpler world, connectivity was affected. “The great solar storm of 1859 produced an auroral light show not to be believed, but it also knocked out telegraph systems,” said Lucas. “We have much more to lose today.” “Solar Superstorms” illustrates the event and documents how scientists are studying ways to understand and detect a similar event. Live action and special effects are part of the cinematic mix and facilitate the storytelling. The Spitz team, interested in experimenting with and developing techniques for live-action gigapixel photography, went on location to the Rocky Mountains, where the Carrington Event had been witnessed by a Denver newspaper reporter. “The live action sequences lead audiences to a more direct experience of the subject matter,” said Lucas. “We knew we could get a lot of vertical dimension to imagery that would work well on the dome – the sky, characters in the foreground, amazing vistas, trees. We worked out scenes, then reconvened in Philadelphia in a green-screen studio to shoot the live action characters. It is this kind of intensive collaboration that I find to be the most rewarding about dome production,” said Lucas. NSF recently awarded a $1.5 million grant to CADENS (Centrality of Advanced Digitally ENabled Science) an NCSA-led initiative led by Cox to develop and widely distribute a series of science documentaries highlighting visualizations of computational and digitally-enabled science. “Solar Superstorms” was the first production to receive funding from the grant. This article first appeared in The Planetarian and is reprinted here with permission of the International Planetarium Society (www.ips-planetarium.org).